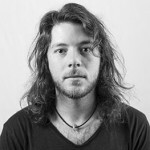 Martin Wilson is a Cape Town based artist, engineer and part-time lecturer at the Michaelis School of Fine Art. Although originally born in Westville, Durban, he moved to Cape Town to study at the University of Cape Town – obtaining both a Masters degree in Electronic Engineering (2011), and a Bachelor in Fine Art (2015, with distinction). Martin’s interest in visual perception began during his research in the field of machine vision, but he soon became frustrated with the arbitrary academic divide between the arts and the sciences. In an effort to bridge this gap he decided to turn down a promising career in engineering in order to enroll in art school. Unsurprisingly, Martin’s artistic practice is still deeply entangled with scientific enquiry – simultaneously adopting and critiquing its methods and values. In particular, his work seeks to question the legitimacy of any true objective knowledge in our chaotic, fluctuating and unpredictable world, and to emphasize the inherent limits of human perception and comprehension. His most recent sculptural works are constructed from non-traditional carbon-based materials such as organic remains, ash, charcoal, graphite and oil. These fragile but imposing objects reference the visual languages of archaeology, geology, and museum display in order to explore the disquiet spaces wedged between rational knowledge production, enchanted curiosity, and the horror of the unknown. Cape Times. 2017. A new slant on art, incorporating video by Danny Shorkend. Online. Design Indaba. 2017. Two artists use video and sculpture to explore perceptions of history and memory by Bongani Shweni. Online. Art.Co.Za 2015. A Portrait of a Young Artist Series: Access – A Serendipitous Symbol by Charis de Kock. Online. Wilson, M. 2011. Coded Aperture and Coded Exposure Photography: an investigation into applications and methods. University of Cape Town, South Africa. Online. Wilson, M. & Nicolls, F. 2011. Coded Aperture and Coded Exposure Photography. Proceedings of the Twenty-second Annual Symposium of the Pattern Recognition Association of South Africa (PRASA2011). Vanderbijlpark, South Africa. 156-161. Online.